Rory McIlroy during a practice round at Augusta. Pic by Getty Images. A resurgent Tiger Woods, world number one Justin Rose and Dustin Johnson are among the favourites for the year’s first major championship. 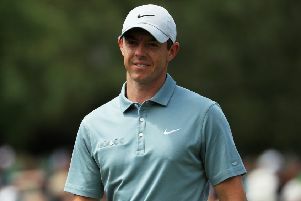 “I’d find it hard to pick one (winner) but Rory is playing terrific and would probably be number one,” Nicklaus told ESPN. “DJ, Tiger... you just go right down the list. Justin Rose is playing great and Tommy Fleetwood, no one is really talking about him but he’s been playing great. Rickie (Fowler) has been close quite a few times.